Hang ’em with their own words! Even if you got a “D-” in your evidence class, when you saw that question you instinctively thought to yourself, “Objection! Hearsay!” My question called for the most obvious objection in the world, right? That’s why it’ll probably surprise you that my opponent didn’t jump up from his seat to yell “Objection!” In fact, he didn’t say a word. He just sat there and continued taking notes. Admissions, especially when they’re caught on tape, are usually the most damaging evidence your jurors will hear. If you’re lucky enough to have a taped admission from your opponent, there are a number of wonderful things you can do with that evidence. For example, let’s say that you’ve got a 30 minute recording of a statement your opponent gave to the police about the crash. How many different ways could you use that recording? The first and most obvious choice would be to play the entire statement for the jury during your case-in-chief. You’d simply call the police officer to the stand, ask him to authenticate the recording, and then hit “PLAY.” Nothing to it, right? The next way to use the recording is during cross-examination. Normally, when cross-examining witnesses about prior inconsistent statements, you confront them with the prior statement by reading it aloud from the transcript. Imagine how much more powerful your impeachment would be if the jurors heard the inconsistencies from the witness’s own mouth? It would be a lot more difficult to deny the prior statement, wouldn’t it? Attorney: But the very next day, when he was interviewed again, he made a very different statement, remember? In the old days, if you were lucky enough to have a recorded admission you wanted to play in court, the only easy way to do it was to bring your handy-dandy cassette recorder and play the entire statement. But the problem with playing the entire statement is that the recording rarely consists solely of statements against interest. Usually, recorded statements also include lots of self-serving hearsay and irrelevant comments. Out of the entire 30 minutes worth of “admissions,” you may want the jurors to only focus on less than a minute or two worth of testimony. Back then, if there were any parts you needed to skip (such as suppressed statements) or any parts you wanted to highlight, you’d be stuck hitting the fast-forward button and keeping your eyes on the tape counter until you found what you were looking for. At best, it took too much time to fast-forward to the appropriate spot. At worst, your presentation became a comedy of errors as you fumbled and bumbled with the fast-forward and rewind buttons until anti-climatically reaching your impeachment material. Redacting an audio statement to remove irrelevant sections. No longer do you have to worry about the jury hearing irrelevant, suppressed, or improper comments. Simply highlight the improper comment and click <DELETE>. Presto! The statement will be removed, and you can now save the file as a new audio recording. Go to <PROJECT> and click <IMPORT AUDIO>. Choose the audio recording you want to import. Choose a filename for your recording. (It’s easier to retrieve the correct statement during trial if you use descriptive titles for each file, such as “The Light was Red” or “The Light was Green”). That’s it! Now you have a standalone .WAV file of the admission that you can play on any computer. Be creative and think of how you could use those admissions. Could you use them during settlement negotiations by burning a “Greatest Hits” CD for your opponent? (“Here are the six times during depositions where C.E.O. admits to liability.”) Or import the statements to your iTunes playlist, so you can quickly click on the correct statement to impeach witnesses during cross-examination? Statements of party opponents, especially recorded ones, can be some of the most powerful evidence you’ll ever admit. But just as with every other exhibit or testimony that you’ll ever offer into evidence, it’s not enough to simply understand what you should show to the jury. To get the most out of your evidence, you’ll also need to master knowing when you should admit it and how you should publish it. Learn how to use an audio editing program like Audacity to extract your admissions, and you’ll be able to play them to maximum effect for your jury. The interview was conducted in Spanish, not English, so he couldn’t play the original audio recording. Not everything in the interview was relevant to the case, so the jury would only be allowed to hear certain parts. Our rules of evidence place limitations on the admissibility of transcripts in criminal trials, so he couldn’t just admit the transcript and ask the jurors to read it. Ask someone else to help you. If he had read all three parts of the transcript himself, he would have run the risk of either confusing the jurors or boring them to tears. By asking the three of us to read our individual parts, he eliminated the risk of the jurors confusing who said what, and made it more interesting for the jurors. Highlight the witness’s lines. By taking a highlighter to all of my lines, I could easily see what I was supposed to read next. That’s especially important when you’re reading from a back-and-forth exchange. Highlighting all of the witness’s lines ensures they won’t miss any lines and also ensures there won’t be any awkward pauses while you wait for your reader to realize he’s supposed to be speaking. Clearly mark any stopping points. If you’re only reading portions of the transcript, use the highlighter to draw a line across the entire page where they’re supposed to stop. When witnesses are involved in a quick back-and-forth exchange, they can get caught up with reading their lines, and miss the small “Stop!” marks written in the margins. 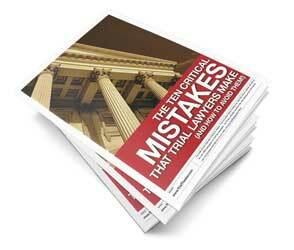 Don’t risk the chance of your witness reading irrelevant or inadmissible testimony to the jury. Clearly and boldly mark where they should stop. Tab the appropriate pages. Just like on the radio, you want to prevent the courtroom from filling with “dead air.” When your witness is flipping through pages of the transcript, trying to find what portion he’s supposed to read next, it breaks the flow of your presentation and gives the jurors’ minds an opportunity to wander away. Prevent “dead air” by tabbing the witness’s transcript, so he clearly understands which portion to flip to next. Combined with the highlighting, this little bit of extra effort will make it much easier for your witness to smoothly present the transcript. Ask your “reader” to read the transcript beforehand. By reading the transcript in advance, they’ll note any grammatical difficulties or pronunciation difficulties they might encounter. You want to make sure that they can pronounce the words and capture the flow of the language. Think about reading any of Shakespeare’s works aloud – you wouldn’t want to pick up the text and just “wing it.” By reading the document in advance, your reader will discover if there are any words they can’t quite wrap their mouth around. They’ll be able to fix the problem beforehand, so that your courtroom presentation flows smoothly. Ideally, if you know a witness won’t be available, you’ll want to set up a multi-camera recording of his deposition so that the jury can hear exactly what the witness said and see exactly how he said it. However, when those set-ups recording are unfeasible or too expensive, enlist the help of a friend to read the transcript to the jury. Done well, the results can be almost as effective as taking the jurors back to the scene.